Taken last week with my "not quite as trusty as my last cellphone camera" cell camera. One of my favorite sights is trees against the sky. Envisioning some paintings of this nature...(double pun) However, finding it hard summoning up excitement to draw all those teenie, tiny branches. Lazy, maybe. Just monotonous. Perhaps, I will do a slightly diseased tree, it would also turn a bad thing into good! 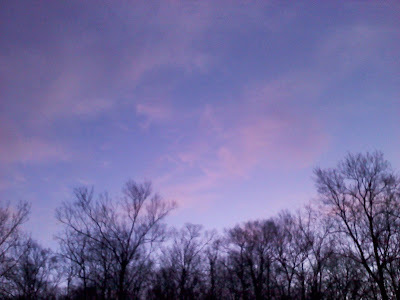 Go directly to http://www.skyley.blogspot.com/ to see some beautiful sky shots taken with much better cameras than mine. Happy swf. Love seeing a little color in the sky again. I looks like spring is trying to pop out. Thanks for the reminder about plastic wrap- I even have some tucked away that I use for my oil paintings. My mind is slipping. It is terrible!